It’s FNCE. You’re excited, but also kind of terrified. You know maybe 3 other people who will be going. You walk in, you start squinting around for a friendly face among thousands of dietitians at the registration booth. Maybe you see one, maybe you walk around aimlessly looking for the expo floor. What do I wear? Where do I go? Should I ask a question at a session? If you’re excited for FNCE but have no idea where to start, keep reading. I’ve got some tips to share from my experience as a first-timer at FNCE. Use the FNCE App to help keep you organized. 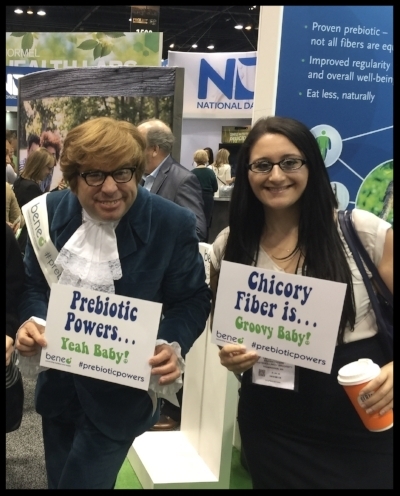 There’s so much going on and FNCE can be overwhelming. Be sure to download the FNCE 2018 app a few days before you arrive in D.C. and use it to help keep you organized. You can mark each session that you want to attend and it will sync directly to your phone’s calendar. You’ll also be sure to receive any notifications of room changes, fun expo demos and more. Business casual dress is generally the standard at FNCE. Do not feel pressure to dress like you’re the CEO of a Fortune 500 company! Convention centers are huge—which means there will be plenty of walking. You will see some dressed in stilettos and pencil skirts, and some in jeans and a T-shirt (generally those are the OG dietitians). There is no formal dress code, and nobody’s paying attention. If you feel like wearing a cheesy T-shirt with a food pun on it, go for it (see what I did there). However, if you’re looking to make professional connections or speak to an internship coordinator, you want to look the part. Snag the free stuff, but make a point to learn something new on the expo floor. Eat all the things, learn all the things. Granola bars, pasta, yogurts, sandwiches, crackers, butters, juices, supplements, apps, insurance, food councils, internship sites, universities. You want it, the expo floor’s got it. Each exhibitor will have a booth at FNCE where they will be giving out free goodies and selling you on their products. If you’re applying to DICAS soon, the expo floor has recruiters. Use it to your advantage. Go to the talks that you want to go to. The expo floor can be overwhelming, but is you definitely don’t want to miss it! There are things I’ve learned in FNCE educational sessions that I will remember for the rest of my life. These are the experts, speaking on a career’s worth of knowledge. If you’re interested in a subject and see a talk that’s relevant, don’t follow your friends. Going alone to a talk is thousand times more valuable than going to a boring one with a bunch of classmates. Ask a question at a talk. I mean, if you want to. Don’t let the fact that you’re still a student psych you out of speaking up. You’re still a nutrition expert, and your experience counts. The people in that room are in that room because they’re all learning about a new topic just as you are. If you’re a shy one (like me), the speakers are always more than happy to answer questions after the session ends. Be assertive at the internship fair. I know, assertiveness isn’t everybody’s strong suit. When I attended 2 years ago, the internship fair overwhelmed me. There were hundreds of potential interns running around in a too-small room trying to swoon as many recruiters as they could. Know which programs you’re interested in first, and target those. Otherwise you will be running around listening to 10-minute spiels about a program you figured out wasn’t for you in the first 30 seconds. Do not let it intimidate you. This is for you. Poster sessions can be a little intimidating. You awkwardly approach an author with their beloved work right next to them, you try to speed read quickly enough that you can ask them a question but also not drag the awkwardness on forever. Tip: DO IT ANYWAY. The poster sessions are where original research, programs and innovations are born. It is a research nerd’s heaven. Ask questions, engage with the authors and don’t feel like you’re bothering them, they worked hard for this! “I definitely follow her on Instagram, should I say something?” YES! Say something. There is nothing creepy about spotting a social media friend and solidifying that connection. Nobody will look at you crazy for starting up a conversation with a stranger. You see a dietitian that you look up to and they have no idea who you are? Say something. The greatest part of FNCE last year was mustering up the courage to introduce myself to my absolute idol (Marci Evans). She ended up giving me incredible nuggets of wisdom and confidence. Make FNCE fun and make it your own. It’s an incredible learning experience and you may just walk out with a whole new stride. Laila Shanaa is a Palestinian-American graduate student in Nutrition Education and dietetic intern at Eastern Illinois University. She is passionate about eating disorders, social justice and weight stigma as it relates to the nutrition field. You can find her on Instagram @flawednutrition and at the Sunday FNCE Poster Session from 9am-2pm (#94).